The Royal Ballet brings its celebrations of 70 years at the Royal Opera House to a close with a mixed programme of three luminous masterworks by its Founder Choreographer Frederick Ashton. Eden Cinemas will be showing a live satellite broadcast of The Dream/ Symphonic Variations/ Marguerite and Armand on Wednesday 7th June at 8.15pm. This gorgeous mixed programme demonstrates the great creative vision of Frederick Ashton . The Dream is Ashton's adaptation of Shakespeare's riotous comedy in which a forest sprite plays havoc, armed with a love potion. Symphonic Variations was Ashton's first work after World War II, and one of the Company's first to be performed on the huge main stage of the Royal Opera House, in 1946. With six dancers performing a series of quartets, duets, sextets and solos to Franck’s brooding Variations symphoniques, this seminal masterpiece celebrates the pure beauty of movement. Marguerite and Armand is Ashton's beautiful and emotional retelling of a well-known story, familiar to us through #Verdi's opera La traviata. Ashton famously created this poignant ballet on Margot Fonteyn and Rudolf Nureyev in 1963. 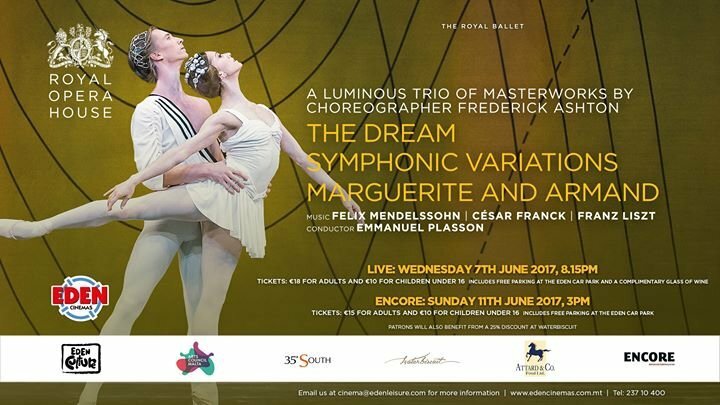 Be part of the global audience by viewing the Royal Ballet live broadcast for one night only on Wednesday 7th June at 8.15pm. Tickets for the live broadcast are available at €18 for adults and €10 for children and under 16. This includes a complimentary glass of wine and complimentary parking at the Eden Leisure Car park. If you’re unable to attend the live show, an encore screening will be held on Sunday 11th June at 3pm. Tickets for this are priced at €15 for adults and €10 for children, including free parking. The event is sponsored by Attard and Co, 35 South, Encore magazine, The Malta Arts Council and Waterbiscuit.